Part way through this project, an existing customer requires a site-wide Wireless Network to cover all areas of their facility. And it’s quite a large facility, with a number of highly specialist manufacturing buildings, all of which needed to be inter-connected with fibre cabling and centralised as part of an overall Secure and Efficient Network Design (based on the Cisco Enterprise Composite Model of course). The Wifi part of this network needs to support the usual mobile devices and computers used by various technicians and engineers, but also some areas of computerised management devices (CCTV, Air Conditioning Systems, Heating Controls etc…). Dual Radio Access Points – This helps to allow access for devices on two seperate bandwidths (2.4Ghz and 5Ghz), the type of Access Points being deployed also support Beam Forming and Multi-Path Propogation. Use Cisco Structured Wireless-Aware Network (SWAN) – This provides the framework to integrate and extend wired and wireless networks. 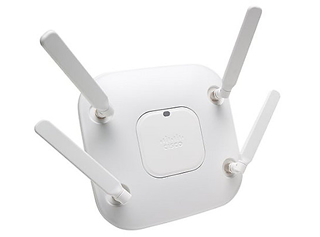 Cisco SWAN extends “wireless awareness” into important elements of the network infrastructure, providing the same level of security, scalability, reliability, ease of deployment, and management as wired LANs. Include Capacity – Don’t just look for coverage, also plan for capacity to ensure the Wireless Network can handle the amount of data expected to be sent/received. Include Network Access Controls – Straightforward for company devices and domain computers, but further planning needs to be considered for other devices. Mobile Device Control provides a method to manage smartphones and tablets. Whether it’s corporate devices, or employees bringing their own (BYOD), a solution has been implemented to handle the initial setup and enrollment, authentication and registration. The project is moving on nicely and should be completed within the next couple of months (there’s a lot of AP’s to install! ), once it’s finished though the company will have an effective Wireless Network for staff to have instant access to email, internet and other IT services irrespective of location. If this service is of interest to your business, simply contact us and we will be happy to provide you with more information.